The Assiniboine Tribe was a hunting-gathering people whose range encompassed the prairie lands between the Saskatchewan River in the north to the Missouri River in the south. They were relatively horse poor, which contributed to their daring as cunning horse thieves, especially against their avowed enemy, the Blackfeet Nation. Their surprise winter horse-stealing raids were legendary. Z.S. 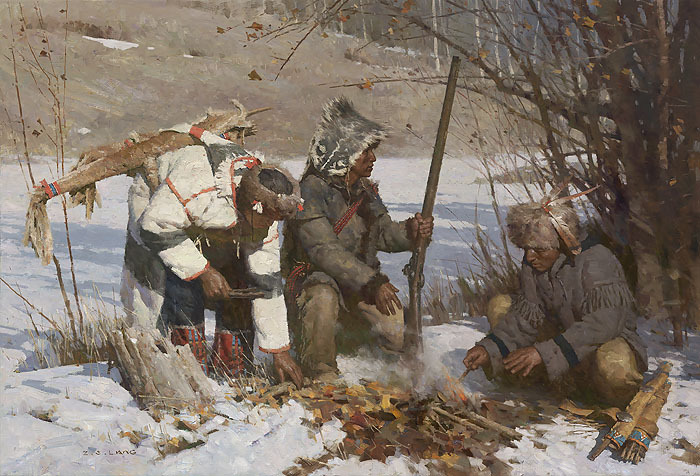 Liang’s "Assiniboine Hunters" shows why he is regarded as one of the most important and skilled painters depicting the Native American experience today. The varied warm and cool grays on a design of positive and negative shapes come to life in this Fine Art Limited Edition Canvas. These hunters have stopped to warm themselves and rest, having failed to find game during a morning search down Otter Robe coulee. The one possessing “badger medicine” sees movement at the distant timber edge. Perhaps luck may yet turn in their favor!